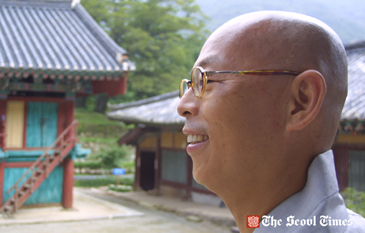 On Sept. 23-24, 2005 I accompanied more than 40 foreign journalists and their families based in South Korea to take part in a one night temple stay at Mihwangsa in Haenam, Jeollanamdo.It was organized by the Jogye Order, the largest and most influential sect of Korean Buddhism. Setting off from Seoul on the ultra modern KTX (Korea Express Train) we arrived in Naju, Jeollanamdo three hours later. It was fitting to travel on such a modern symbol of Korea today en route to discover a little piece of the Korea of yesteryear. 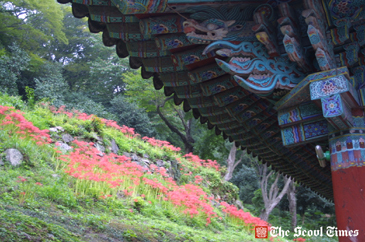 The crisp air and clear blue sky, typical of Korea's autumnal beauty, lent to the pleasure of visiting the Buddhist Temple hidden deep within the enclaves of the mountain. The 'land of the morning calm,' the title by which Korea has been traditionally known, is difficult to associate with while crowding onto a packed subway carriage on a morning in Seoul. Our surroundings for the duration of our tour were to make it seem so much more appropriate. 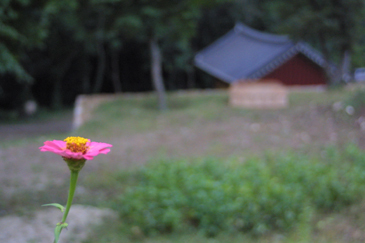 Our first stop was Daeheungsa, a temple located on Mt. 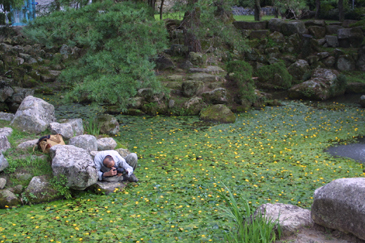 Duryun, a provincial park in Jeollanamdo. A tranquil forest graces the foot of the steep mountain, setting the scene for the peace and relaxation to come. 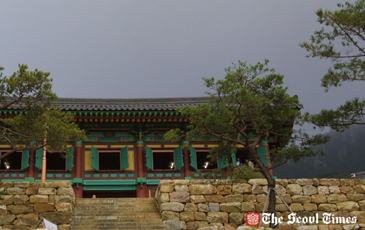 Daeheungsa, established before the Goryeo Dynasty, was well known as a meeting place of the great monks such as Grand Master Seosan. 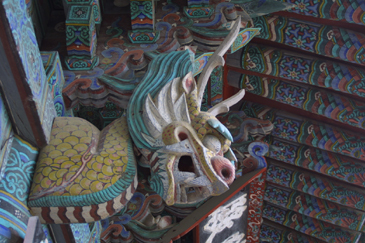 Daehungsa Temple and the Grand Master Seosan are synonymous with each other as a result of the Hideyoshi Invasion of Korea in 1592. Seon Master Seosan defensively claimed then that Daeheungsa was a place which would never be destroyed by Samjae (the three disasters of flood, fire, wind). 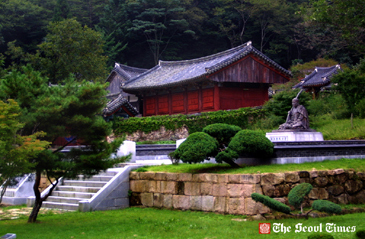 In addition, Daeheungsa is where Seon Master Choui, the great teacher of Korea Tea culture, met the other great scholars of his age such as "Chusa" Kim Jung-hui and "Dasan" Jeong Yak-yong. We were introduced to the head monk of Daeheungsa, Bubin sunim, who acted as our guide for a brief tour of the temple grounds. 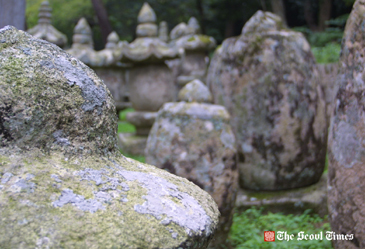 First off, we were shown the site of the 'budo' stones. 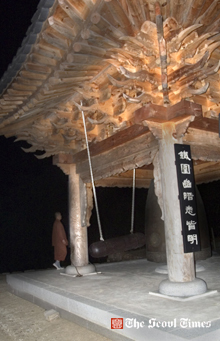 Unlike a stupa which contains relics of Sakyamuni Budda himself, budo is a stone monument that contains the Sarira (sacred remains or relics) of a great monk. 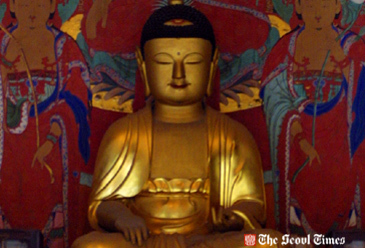 Next we had a look around the main Budda hall and Cheon-bul-jeon (hall of a thousand Buddas), after which, we headed to our next stop, Mihwangsa temple, located another hour away. Upon arrival, we were first asked to change our clothes. Donning the apparel of the monks added to the realism and authenticity of the experience, making me feel like more of a participant than a mere spectator. Next we were assigned to our rooms. We were given an orientation by the temple staff in terms of how to behave in the temple, the expected form of conduct in the Budda hall, how to make Hap-jang (placing palms together) and how to perform Ban-bae (a simple bow). Before we had a chance to get comfortable we were ushered out to the main hall for Balwoo-Gongyang,a unique Buddhist meal consisting of four bowls of different sizes. 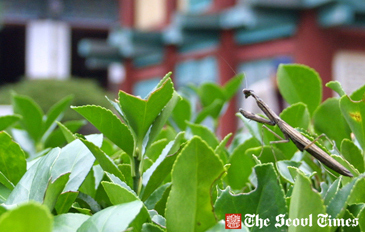 From largest to smallest they contain rice, soup, side dish and hot water( for cleaning) respectively.With the striking of Juk-bi (bamboo striker), the head monk, Kumgang sunim, recited a chant which lauded the efforts which went into producing the food. The meal itself is all part of the spiritual experience. Nothing is to be wasted and as such we were each required to finish all the contents of each dish. We then spent some time strolling the grounds of the temple. Following this, we in turn had a chance to beat the Dharma Drum sending it's beat out into the cool darkness of the mountain. The echo of the drum was amazing, spreading the sound of Buddha's teachings out to the world. 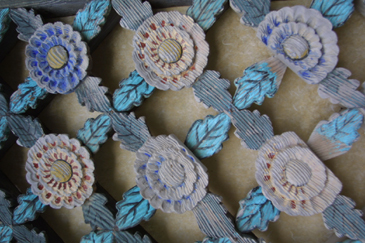 Spreading the Dharma symbolizes saving all of the Earth's sentient beings. Then it was time for evening Yebool (Buddist ceremonial service). The monks practice this three times a day. First at pre-dawn from 3 to 4 a.m, next again at 11 a.m. and finally at 6 p.m. The ceremony involves chanting and bowing in front of the altar, paying respect to Sakyamuni Buddha and all his disciples. 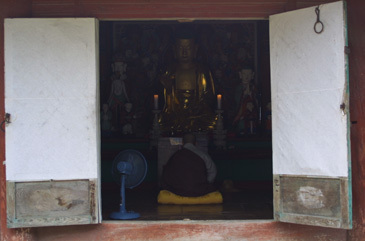 Next on the agenda was Cham-seon (Seon meditation) one of the foremost characteristics of Korean Buddism. Cham-seon which follows the tradition of Juaweon or sitting meditation of Hwadu (main question) means entering into concentration. Through this meditation, people attempt to find their true selves. The head monk, Kumgang sunim, led us in the ritual. He instructed us to expel all the evils out of our minds while we exhaled while simultaneously taking in happiness and cleanness as we inhaled. 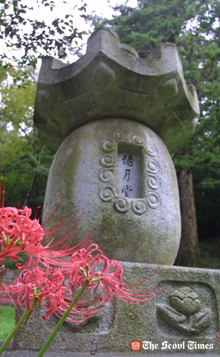 In the course of the meditation a practitioner focuses on the Hwadu "Imeokko.This is a question asking not solely what a thing itself is but asking about the nature of things. Who am I? Or how should I live? Or how can I be totally free from all sufferings? Our final experience of the program was the Da-Do (Tea Ceremony). Unlike meeting for a coffee with friends back home each movement of the ceremony is ritualized. The rules you must follow along with the calming influence of the tea are meant to symbolize enjoying life more fruitfully. 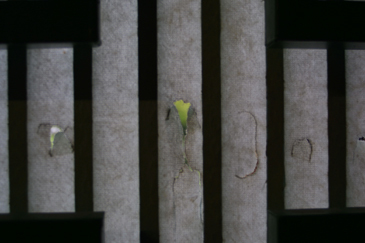 The tranquility of our surroundings added to it's effect. 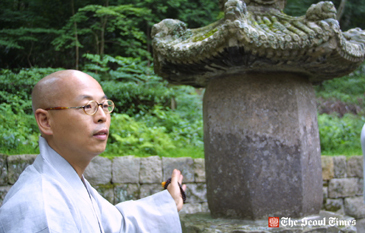 Buddhist monk Beobin points to a budo of Daeheungsa. 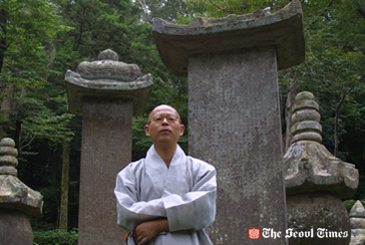 Beobin, the Buddhist monk at Daeheungsa Temple, poses against backdrop of a group of budos. 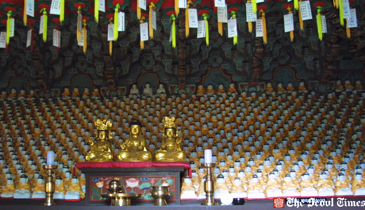 Daeheungsa Temple's Cheonbul Hall or "Hall of A Thousand Buddhas"
Ms. Teresa Park serves as director for public relations for The Seoul Times. Ms. Park holds a master's degree in English from Yeungnam University in Daegu. She also studied Old English at the University of London. Ms. Park lectured English at Yeungnam. She also taught Korean language at SIWA (Seoul Int'l Women's Association).